A look back at some of the best highlight reel plays from Bedlams past. There have been many great and memorable plays in Bedlams past — last year’s edition could fill its own post — but I’ve narrowed this list down to eight of my favorites, in no particular order. The Freak made Big Game Bob sorry he ever decided to re-punt while simultaneously throwing Mike Gundy a life jacket, and then followed it with a ?. There were plenty of things that had to fall just right for the Pokes to win their latest Bedlam, but none were more decisive or dramatic. When James Washington went dinged up to the sideline, Gundy called off the missing persons search for his former five-star receiver. This was just one of two fourth quarter scores for the Louisiana native and it meant that Tyron would finally enjoy a featured role in OSU’s offense. Oh, wait. This tightly-contested Bedlam episode left me without any fingernails and probably took weeks off of my life. The Cowboys just kept hanging around with timely scores, none more than this. After Landry Jones pushed the Sooner lead up to 9 with 3:03 remaining, Gilbert reignited BPS with this kickoff return to pull OSU back within 2. Unfortunately, the Sooners would quickly answer with a score, but this one made us believe (at least for 17 seconds). Oklahoma State’s franchise back joined in on the rivalry trash talking as part of Bedlam week. If nothing else, this run gives him that right for the rest of his life. Hill had a career-high 228 yards and two scores (on 7.6 yards per carries). Let’s see if he can have another huge game in what may be his last Bedlam. Zac-to-Dez was as fun to watch as it was short-lived. (By the way, I have a feeling Al Pena-to-Dez would have kept my attention). This play was always a memorable one because of the degree of difficulty on one end — it was all Zac could do to get it in Dez’s general area before getting sack — and how simple Bryant made it look on the other. 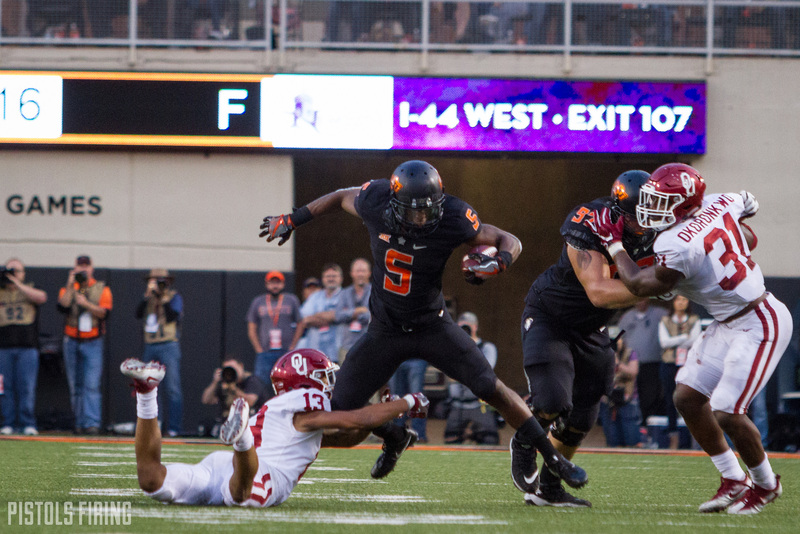 The Sooners, led by Heisman winner Sam Bradford, were just too much for the Pokes, but this play was huge in real time. At one point during last year’s Bedlam, Oklahoma State sacked Baker Mayfield on four straight passing plays — killing consecutive drives. This one was my favorite because you can almost see the that moment that the No. 1 pick caught Bundage in his peripheral vision from a bird’s eye view. By that time it was too late. Thank you, Landry Jones. For all of the memories. This acrobatic tip, catch and return has to be an all-time Bedlam play on any list in my opinion. Bonus play: Did I mention how grateful I was of Landry Jones?